I was in high school when I watched Hard Boiled for the first time with Jamil Schoener and Michael Landsman. It had the most intense, bloodiest, most beautiful shootouts I had ever seen. I didn’t know what I was getting into, but I have since learned that there is a difference between the action movies from the U.S. and what is offered from China. I would come to find out that this film provided exactly what I was looking for in an action movie: less concern for the moral sensibilities found in the West, and instead, all-out, high-caliber action. 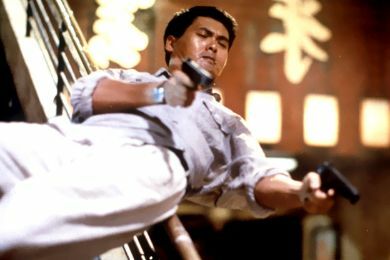 Hard Boiled was made in 1992, written and directed by John Woo and starring Chow Yun-fat as “Tequila,” Tony Leung as Tony an undercover cop, and Anthony Wong as Johnny Wong, a leader of the menacing criminal triads who Tequila and Tony must take down. I later found out Quentin Tarantino and the late, great Tony Scott were largely influenced by John Woo’s action films. Shootouts and fight scenes are always carefully choreographed, but with a John Woo movie, the relentless attention to detail and the sheer duration of the scenes, are an enormous feat in organization. Hard Boiled provides a feast of gunplay that leaves the viewer completely satisfied. You may never need to pop in another action movie again. Smooth and slow, yet bright and beautiful as an operatic ballet. Hard Boiled has tense drama, romantic emotion, even spirituality, all mixed with the acid bark of uzis spitting fire, bringing down hundreds of bad guys in glorious, jaw-dropping slow-motion. For just a taste of what Hard Boiled has to offer, watch this teahouse shootout. And here’s the gorgeous trailer for the film featuring other highlights and the driving track “Motorcade,” by composer Michael Gibbs. This entry was posted in Blogs and tagged action film, Anthony Wong, Chow Yun Fat, Danny Ferry, Ferry Boat Films, ferryboatfilms.com, Hard-Boiled, Hong Kong, John Woo, Keith Schoener, Michael Gibbs, Michael Landsman, Motorcade, Tony Leung. Bookmark the permalink.